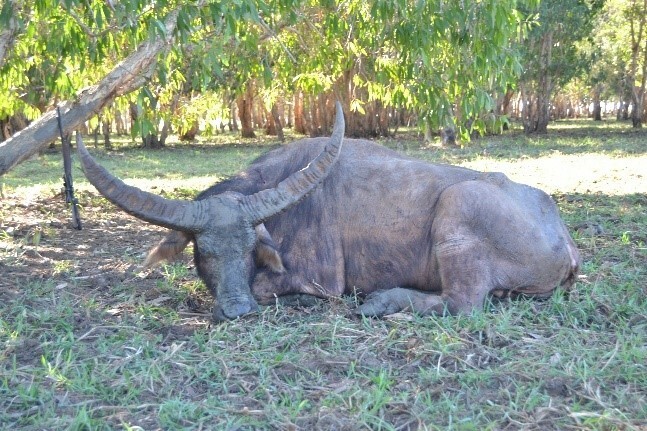 Having already chased the Cape Buffalo in Africa, the next step for me was once to hunt a water buffalo in Australia. Both types of hunting are very similar because both the buffalo in Africa and Australia occur in open steppes / grasslands and in the dense bush / forest and are usually hunted on foot. The biggest difference is the arrival, to Australia are about 24 hours to plan, depending on which connection is chosen. The hunt was to take place in Northern Territory near Darwin, which is known for numerous and strong buffaloes. My choice fell on the Carmor Plains Wildlife Reserve. The over 40000ha privately owned game reserve is an untouched area for native flora and fauna and wildlife. 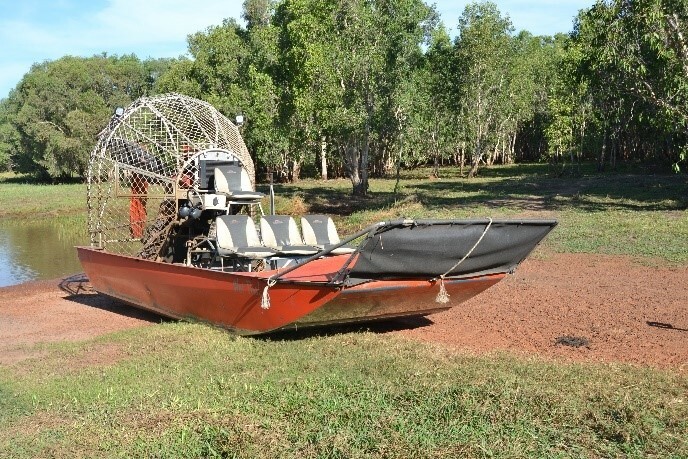 Right next to Kakadu National Park, it offers some of the most exclusive safaris in Australia. 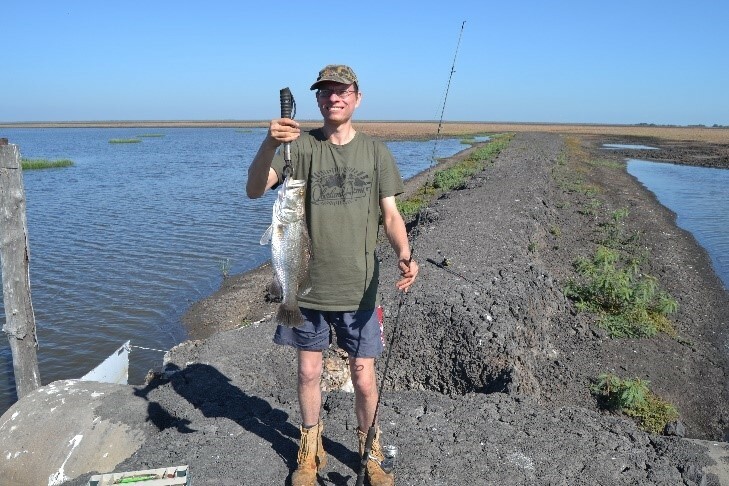 My hunting colleague and I had decided to travel for August, at this time there is still dry season and despite the Australian winter, the temperatures are more like in Germany in the summer. In the beginning of August we started and via Sinagpur to Darwin. We decided to stay one more night in Darwin to acclimatise and spend a night in the hotel after the long flight and relax. The next morning we were picked up by our professional hunter from the hotel. Although for both of us English would not be a problem, we were positively surprised when Julian our guide greeted us in German. We learned that he worked here for 6 months on the farm and will continue to go to New Zealand after our hunt. The entertaining drive led from Darwin over small villages to the bush and grasslands of North America. Already on the way past eucalyptus forests and open grasslands we could observe some buffalos as well as wallabies, a kind of small kangaroos. In addition to buffalo, saltwater crocodiles are also hunted in this area in the form of trap hunting, and lo and behold, when we arrived, the skinners were just about to fly a medium-sized crocodile of 3.7 m in length, which an American had captured. Saltwater crocodiles can be up to 7m here. In the main house we were greeted by Matt our outfitter and clarified the details of the hunt. Since it was not possible to import weapons through Singapore at the time, we decided to lend a gun on the spot, and I recommend everyone to do the same in the future. Matt has a walk-in weapon room that leaves nothing to be desired and more reminiscent of a gun shop. I chose the proven Blaser R93 in 375H & H and my colleague for the Sauer in 375H & H. After the hunting and weapon selection was clarified, we went to bed early after a sumptuous dinner to be fit for the hunt the next morning. On the first day of the hunt, we headed for breakfast in the morning, as we first had a longer drive in the direction of the Kakadunationalpark on the edge of the reserve. Within the vast area are very different landforms, on the one hand, large plains with a kind of grassy steppe, besides huge swamp and water areas and forest areas, which consist mainly of eucalyptus and similar tree species. Day one should take us to the forest region. After we had parked our car well hidden we slowly stalked through the eucalyptus jungle. There are many waterholes in this area which are a magnet for the buffaloes, so we were hopeful to come across buffalo. At first we saw no movement on the ground, but were regularly berated by cockatoos in the trees. After about half an hour of slow stalking, we suddenly saw movement. My hunting colleague, who was supposed to shoot first, got his weapon ready to be ready in case the buffaloes came. Slowly and carefully we stalked closer to the supposed buffalo group in the undergrowth. When we suddenly heard the smacking and grunting, it was clear to us that here we have no buffalos but a rotting sows in front of us. As the wind stood well we came up to about 20m to the rotting zoom in the approximately 20 sows from the boar to strong boars counted. Even after they saw us, they only moved slowly, suggesting a very low-key hunt of the sows. After the sight and a good number of photos of the rump, we slowly marched towards the next waterhole. And again we met some wild boars that had broken in the morass to edible, but unfortunately no buffaloes. But we did not want to give up that fast, so we went on step by step in the swamp to the next well-hidden water hole in the middle of the eucalyptus forest. In this area, good waterproof hunting / hiking boots are appropriate. Already when approaching we could hear activities in the water, so we stalked even more cautious than before to attract as little attention as possible. The closer we got to the water surface the more movement was visible. And this time it was actually buffaloes that we could see in the partial shade. Unfortunately, the wind was not on our side this time and so the buffaloes got along with us despite the careful stalking and pulled past us on 20 meters, but through the dense shrubbery it was neither possible to talk to them let alone shoot. For the rest of the morning we did not see any buffaloes anymore, so we headed back to the lodge for lunch. In the afternoon we tried our luck in a more open area and saw a lot of water buffalo but it was only young bulls and cows with calves, so we did not stalk and when it got dark back to the camp returned. During the dinner we learned that in a slightly different area of ​​the district two old bulls were seen, who circle not far from the main camp. So our plan was clear for the next day, in the morning it should go to this place to meet with luck on the bulls. As agreed, we went on the second day in the direction of the previously discussed district part. Here is a mix of water, open grassy area and scattered shrubs and trees which does not make things easier. From a good distance we could already see two buffaloes, to make sure that they are the cops we had to get closer. Due to the open area no easy task. We made our way on foot, taking advantage of every little bush and tree and moved only when the buffalo looked in the other direction for a moment. So we came slowly but purposefully closer to the two buffaloes. From about 300m we could confirm with certainty that these are the two cops. Now it was to be careful and the last few meters to make a suitable shooting opportunity no more mistakes. In our snail’s pace we went from tree to tree until we finally were about 150m from the bull. From here we saw a last tree 110m away from the bull, which was ideal for my colleague to paint the weapon. Julian and I stayed at 150m and my hunting colleague slowly stalked the last tree. But now the cops had noticed something and eyed us suspiciously, we froze to stone and did not touch a millimeter for 10 minutes. Since we had ideal wind, the bulls calmed down and began to eat. Now my colleague could set up the weapon and I with the camera. As the stronger bull then wide stand, he let the 375H & H from the Sauer fly directly into the chamber and the buffalo went down immediately in the bang. To be on the safe side, he gave a margin on the hand, then his buffalo was killed. The second buffalo tripped after the shot and disappeared into the wetland. Happy and proud that we were able to kill our first bull after two days, we took our pictures and drove back to the main camp to take care of him. In the afternoon it should be my turn and this time we drove into the more open terrain with many smaller groves, where we saw many buffaloes before, but still waiting for the right old bull. We stalked all afternoon and again saw many buffaloes without first meeting strong bulls. At the last piece of forest for this day we could suddenly make out a group of bulls, which are just running out of the protective forest in the open area towards the swamp. A quick look with the binoculars and it was clear here is a suitable cop. As the buffaloes were quickly on the way we quickly but carefully cautious through the small forest until we came to the forest field edge. Here we first hoped to find a suitable bull and if possible to kill. On a large stone I was able to set myself up and saw the buffalo in the riflescope. 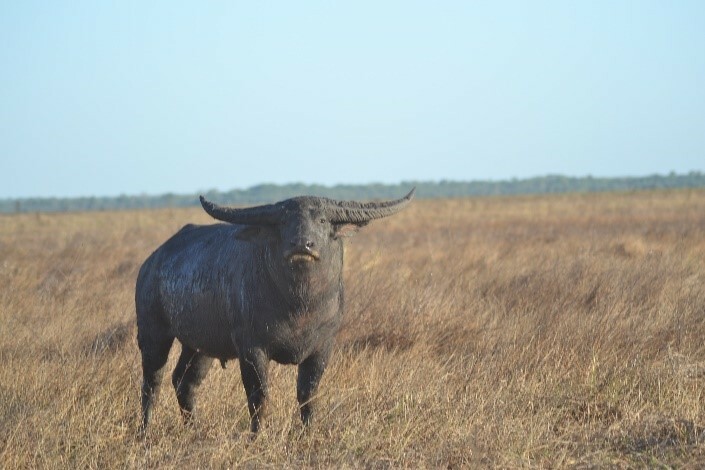 We could also choose the right buffalo, however, these were now moved away to 200m from us, which is not ideal with the 375H & H, but also always run away from us. So we had no choice but to follow the bull into the open area. In the creeper it went after the herd. We were able to keep the gap constant at 250m, but when the buffaloes finally reached the swamp, they were eyeing us. Since we lay flat on the ground, they could not really make out despite the open area, but for us, there was no shot from here. 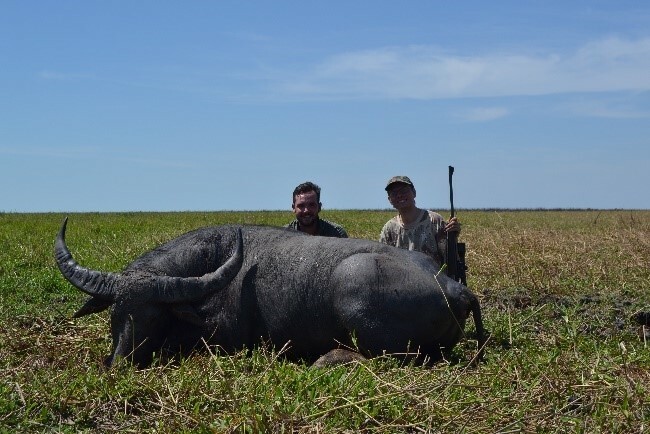 After about 20 minutes without chance and the buffalos who moved further and further into the swamp and did not let us out of sight, we decided to give up the hunt and to make another attempt the next day. As we say so beautiful of all good things are three, so it went with the best hope in the third day of our hunt. This morning it was supposed to go back to the spot where we had to let our bulls in the swamp the day before. We stalked the entire forest for the buffalo, but we were unable to spot any bulls, except some wild boars and cows with calves. After two hours we decided to go to another place to try our luck again. Already as we approached in the vehicle we could see two buffaloes together with cows on the edge of a swamp area. We parked our 4X4 out of sight of the group and stalked slowly. Now that we were in a completely open area, we had to approach the group very carefully, step by step, kneeling and cuddling. Due to the strong wind that blew us directly from the buffalo group in the face the group could not get wind from us. So Julian and I scrambled meter by meter towards the group while my hunting colleague stayed behind to film at a large distance. When we approached the group at about 100m, I adjusted my knees and had the selected bull in the riflescope, however, he was still pointed, so that no shot was possible. Now 20 long minutes began to feel like an eternity, the cop did not take his eyes off us and my legs began to tremble and burn with acidity due to the unfamiliar posture. After 20 minutes, the cop finally did the favor for us and turned wide and I was able to deliver the first shot full of leaves at about 100m in the knee. Despite the perfect shot of the bull standing as if nothing had happened, two more shots on the R93 side finally made him falter and finally I was able to miss him with the Sauer, the R93 was now empty, nor the last shot, whereupon he collapsed on the spot. Although generally speaking, African game is shot-hard, what I experienced here at the buffalo was more shot-hitting than any I’ve ever encountered in Africa, including all the biggames. After the exhausting wait and the final shot my guide and I fell in love with each other and then went with our colleague, who had joined us, to my buffalo bull, to take many pictures and then the trophy in the camp supply. Thus, our main goals of hunting Australia were done after 3 days. For the afternoon, the hunt from the Airboat to Geese was on. Due to the huge marshes and water areas with reeds and grassy areas, many geese live in the Carmorplains. Freshly fortified after lunch, we started immediately and we took the airboat on the water surfaces through the reeds in the direction of the goose. During the trip we could see countless buffalos in the water but also on the shore, as well as various rumps of wild boar digging in the morass on the shores. Equipped with a shotgun, we were able to shoot some geese from the airboat. The swarms are enormous, so that sometimes the entire sky was black with geese. In addition to hunting, the airboat ride was also a great opportunity to see the vastness of the area and to get to the most impassable places to film and take pictures. Back in the camp, three of the geese were fed to one of the pets, a 4-5m long monster crocodile, which was originally caught as a problem crocodile here and since then lives here in his enclosure. After the hunting activities were over for us, we took the last two days to extensively for photography and fishing. 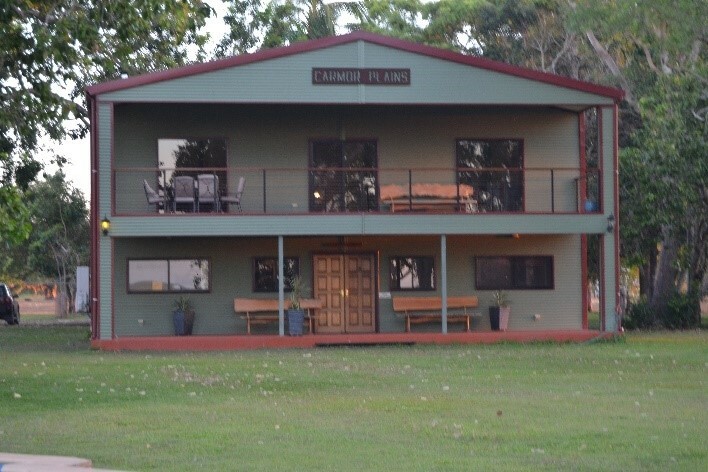 Camorplains offers great opportunities for fishing on Baramundi. This species is found here in some waters and tastes excellent. 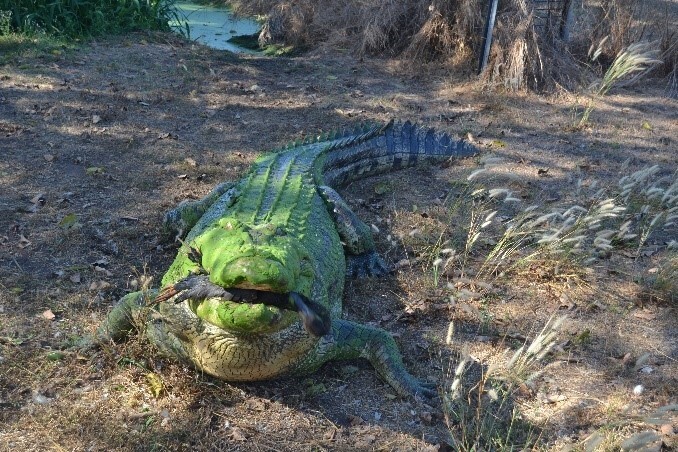 During our fishing trip, we were able to catch 16 baramundies in three hours, with the main attraction being a crocodile that had bitten on a fish that was just hanging from our turn signal. After 20 minutes of drilling, the blinker finally broke out of the crocodile’s mouth and it swam a richer experience. After six eventful days in Australia, it was time to say goodbye to the farm and it was back to Darwin to fly back home. In conclusion, a very nice time is remembered for me and those who are not afraid of the long flight will surely get their money’s worth in Australia. The shooting prizes in Australia are usually much cheaper compared to Africa, and the trophy is not inferior to that of an African buffalo.